This white elephant has barely been operational since it started “operating”. 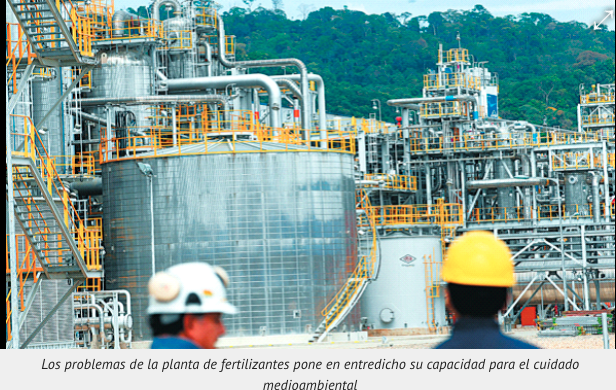 This plant operates at 30% of capacity, was supposed to have been built close to its natural market: Brazil. Instead, was built-in the stronghold of the coca growers of the Chapare and there isn’t even proper and competitive transportation, no railroad system, but they bought some freight wagons… a total disaster like most of the state-owned enterprises that this demagogue, inept and corrupt government did over the last twelve years. Since evo has absolute control of ALL State powers, there is no accountability in place nor proper, professional reliable mechanisms to monitor pollution disasters. From YPFB they indicated that the ammonia leak was internal. There is concern in the area of the Cochabamba tropics. According to the residents of the 23 de Marzo community (Cochabamba), it is the third time that there is a contamination problem and that the death of fish and cattle is proof that something is wrong in the Muñecas gorge. To the Tuesday’s denunciation, in which the Cochabamba assemblymen were concerned and announced with visiting the place, two chemical events are added that at the time generated problems and distrust with the water that is used for human consumption and for the animals. On the subject, the state YPFB informed that it carries out daily environmental monitoring of its effluent waters, at the exit point of the ammonia and urea plant, whose results reflect that the levels of ammoniacal nitrogen are below the permissible limits established by legal regulations, explained the National Vice President of Reservoir Operations, Gonzalo Saavedra. In this sense, he indicated that the measurement of other 11 parameters of effluent water control is being carried out permanently, which are also below the established limits. “Therefore, there was no risk of environmental damage to the waters of the Muñecas stream, much less to the flora or fauna of the region,” said Saavedra. Also, the authority clarified that the incident occurred on May 7, has to do with an internal leak in the ‘Urea Synthesis Circuit Stripper’, that being isolated within this equipment does not represent any risk, and that by means of the technical, specialized and timely intervention was solved according to the constructive standards of the team.